Nectain is a transparent digital procurement ecosystem that offers real benefits to retailers: 30% G&A cost reduction, 95% automatization, and, what’s most important, 10% savings increase. Apart from developing this top-notch procurement system, we’ve implemented innovative AI business solutions into it. They help to deal more efficiently with the typical retailers’ challenges in the process of procurement. A few words about this system. Nectain takes the process of procurement to the new level. How? Thanks to the totally “electronic” approach to traditional procurement activities, such as budgeting, planning, sourcing, ordering, payments, SRM, and inventory. With AI solutions implemented into it, we can proudly say that Nectain is a smart modern procurement system. What problems does AI solve for Nectain? Low-cost effectiveness of sourcing for enterprise needs. What solutions did we choose to deal with these challenges and why? 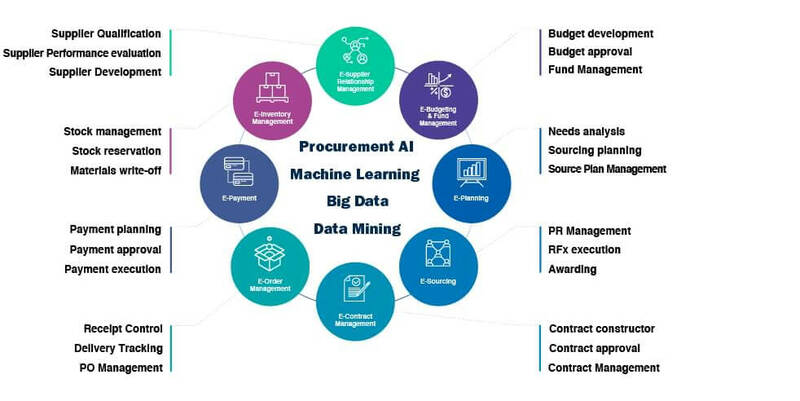 Procurement Data Mining & Analysis. Data mining allows detecting unpredictable patterns hidden in the data generated during users’ routine operations for improving the level of their effectiveness. Machine Learning for e-planning includes the analysis of needs, sourcing planning, and source plan management. We leveraged Artificial Intelligence algorithms for the verification of users’ purchase requests and determination of the most relevant recommendations of profitable positions in real time. With the help of AI algorithms, it is possible to analyze larger amounts of data and offer the most relevant solutions for traditional problems. Smart interaction with suppliers and AI approval of this process minimizes the role of the buyer in the system reducing the risk of a human-made error to the minimum. Artificial intelligence is a significant driver for economic growth in any business. Retail is just one of numerous spheres that benefits from the implementation of AI solutions. Yet, the possibilities of AI in retail are not limited to the procurement system improvement. Artificial Intelligence in retail can be applied in sales, marketing, and communications as well. The biggest challenge of AI adoption is the gap it will create between early AI adopters and followers. Considering tangible results AI is providing, the majority of modern companies invest in AI today.